One of my past times as a child was looking at my parent's art books. I didn't like going to the museum. That meant passing up an afternoon of play and stuffing myself into clothing that made me feel claustrophobic. It meant being eyed suspiciously by curators who I now understand were guarding treasures for the public good. But back then I simply didn't like the feeling of not being trusted. When I got a little older, I started looking at bookstores as kinder, gentler museums. My all time favourites for cheap artistic thrills are museum catalogues. I go to Strand's bookstore, which has exhibition catalogues of all kinds of artwork, from 19th century American painting to sculpture to European furniture. Even better is the packages of art post cards. They are an inexpensive way to own something beautiful. Though it may be true that nothing can compare to an original painting, I seldom have time for such enjoyment. What I liked about looking at an art book is that I didn't have to trade an afternoon of play for artistic enjoyment. My parents told me that some day I would appreciate all the trips to museums. The only mistake they made was calling it "culture". That held no appeal for me at all. I liked it much better when they just said that someone painted really great pictures. Even today, looking at a good painting is like drinking a good Pilsner with my eyes. What made art come alive for me was political art. My grandmother liked Kathe Kollwitz, who was a German artist who was anti war (WWI). 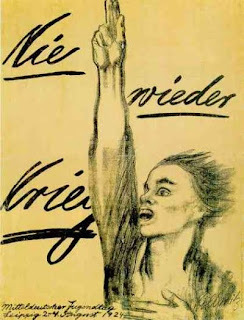 Her famous drawing "Nie Wieder Krieg" focused on the horrors of World War I. Her art was laced with political themes. 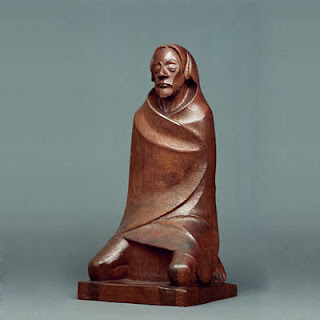 Both she and Ernst Barlach (a sculptor with whom she shared stylistic similarities were on the Nazi's list of "degenerate artists) When art became joined with politics, it became alive to me. To this day, there are ideas I will entertain if they are championed in painting even more than if they are advocated in print. Marc Chagall was my gateway into Jewish art. 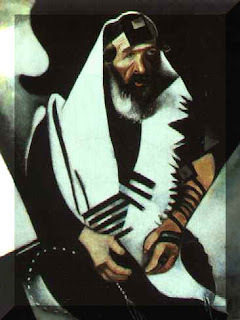 His painting of a man wearing tefillin at morning prayers is soulful and memorable. My all time favourite of Marc Chagall is his set of twelve stained glass windows depicting each of the twelve tribes of Israel. I can not paint or draw at all. I have great respect for those who can do so. Those who paint and draw well are to me what the village letter writer was in days past. In some villages where illiteracy is prevalent, there are professional letter writers, who also read the replies which come back. When someone paints well, they are doing for me what the village scribe does for those who are illiterate. There are in my life artists who give voice to the realities I experience daily. When I was first engaged to my wife, we went to an exhibition of 19th century German Jewish art. Aside from the technical progress of over a century, much of what was in the paintings was familiar to us. 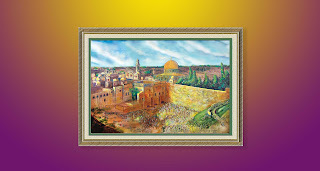 I am fortunate enough to have as family friends two artists who live in our community At the top of this article is a painting by one of them of the Jerusalem, the Holy City. This painting by my friend Boruch Hoffinger conveys tenderness and yearning. I wish he had a book of his artwork. The other friend of our family who is an accomplished painter is Esther Zibell. Her artwork deals with religious occasions and ordinary scenes from Jewish life. She portrays scenes from Jewish life today that feel connected to the past. Some of her work reminds me of the photography of Roman Vishniac.I put a painting of hers at the end of this posting.